I always shop with a list, but I leave room for small unplanned purchases at Aldi because the selection is different every week. The Thomas Farms Free Range Lamb Loin Chop was a nice surprise in my local store recently. 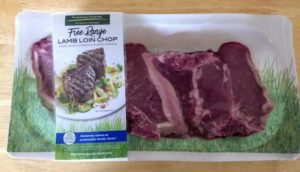 Aldi’s Thomas Farms Free Range Lamb Loin chop is raised without antibiotics or added hormones. It’s advertised as humanely raised on sustainable family farms; the packaging states the lambs roam free on native Australian pastures and in accordance with Thomas Farms’ Livestock Sourcing Procedures standards. Who is Thomas Farms? They are the retail brand of Thomas Foods International, which markets itself as Australia’s largest 100% family-owned meat processor. A quick Google search indicates Thomas Farms products can also be purchased at major retailers such as Target, Publix, and Walmart. Aldi’s Thomas Farms lamb loin chop is sold in the refrigerated section of the store. At time of purchase, it was $7.99 per lb. I paid $7.11 for .89 pounds. The lamb can be frozen if you don’t intend to eat it within a few days. To cook the lamp loin chop, the package instructs to remove the lamb from the packaging, season with salt, pepper, and chopped garlic (optional). Brush lightly with olive oil. Allow to marinate for 15 minutes. Then, heat a grill our saute pan with 1 tablespoon of olive oil to medium/hot. Place the lamb loin chop on the grill or in the saute pan, lower the grill/stove to medium, and cook 5-6 minutes on each side for medium rare (145 degrees internal temperature). Remove from the grill or pan and allow to rest for 5 minutes. Serve with your favorite sides. Our lamb loin chop was excellent. We chose to grill ours, and the seasonings were just right. I used fresh chopped garlic on our lamb, which nicely complemented the salt, pepper, and olive oil marinade. The lamb was flavorful and tender, and my kids even liked it. Our only complaint was that there wasn’t much lamb in the package, so serving sizes were on the small side. We rounded out our meal with some homemade french fries and fresh salad, though, so ultimately there was plenty to fill up on. Aldi’s Special Buy (ALDI Find) Thomas Farms Free Range Lamb Loin Chop cooks up nicely on the grill and is flavorful, with the package instructing to cook in a marinade of salt, pepper, olive oil, and crushed garlic. The only downside is that there isn’t a large amount of lamb in each package, so serving sizes are small if you’re feeding more than two people. Otherwise recommended.